Narrable is a neat service for creating short narrated slideshows. Wes Fryer wrote a glowing review of Narrable and when Wes gives a service high marks I know that I have to try it out. 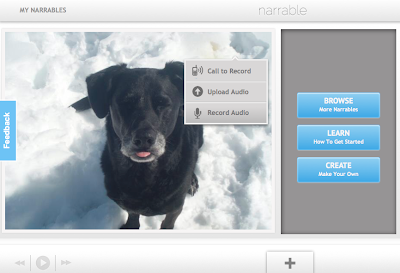 My initial impression of Narrable is that it is kind of like VoiceThread mashed with Animoto. To create an audio slideshow on Narrable start by uploading some pictures that you either want to talk about or have music played behind. After the pictures are uploaded you can record a narration for each picture through your computer's microphone or by calling into your Narrable's access phone number. You can also upload an audio recording that is stored on your computer. Narrable projects can be shared via email, Facebook, or by embedding them into a blog. Narrable could be a good way to get students to tell a short story by adding narration to pictures that they have taken or found online. Have students search for some Creative Commons licensed images arranged around topics that they're studying then record a short slideshow about them. Narrable allows you to have five projects for free. After that you can "earn" more free projects by sharing your projects on Facebook.